Book Of Shadows - "Hanged Man"
From Austin, Texas, Book Of Shadows is the band longtime keyboardist for ST 37, Carlton Crutcher, formed with his wife Sharon Crutcher (vocals) after he left that legendary space rock outfit in 2001. Carlton left ST 37 to pursue an interest in music of a less than rock 'n roll nature, and on their debut CD the band has recorded a very nice set of spaced out songs. Joining the Crutchers are Aaron Bennack on guitar, George Cardenas on bass and Chris Bundy on didgeridoo. Most of the songs are characterized by trippy melodic guitar with hints of Blues, rock and other interesting stylings and variations, accompanied by atmospherics, colorful space electronics and Sharon's mesmerizing vocals that are a haunting blend of Gilli Smyth's space whispers and actually singing. I also hear elements of folk-psych and Shoegaze, and the whole vibe is meditative but in a space voyaging way. But it's the beautiful melodies and atmosphere that are so enchanting. It's all so simple and stripped down... and yet on another level there's so much happening. Carlton's keys certainly help keep things off the beaten path, adding a tasty alien ingredient to the mix. "Bring Ginger Candy" is one of my favorite tracks, featuring Sharon doing spoken word and Carlton taking off just a wee bit into electronic freakout land. "Free" is another highlight, being much like the rest of the album but with plenty of electronic weirdness. And it's to Book Of Shadows' credit that they can incorporate all the alien noodling and have it fit so nicely as embellishment, atmosphere and interesting variety, rather than being some wild contrast that's inappropriate to the songs. "Hermetic Sphere" is another song I enjoyed, having an excellent trippy boogie woogie vibe. Very nice. And "Intangible Smurf" is probably the most purely spaced out song of the set, and another that ranks among my favorites. In the letter accompanying the CD I'm told that this music is not really indicative of the Book Of Shadows sound, explaining that the band focuses more on improv/avant/experimental music. So I guess you would need to see them live to get a better feel for what they're about, or perhaps more recordings are on the horizon. In any event, this is a really lovely set of spacey melodic tunes, just right for a relaxing but mind expanding evening in your favorite reclining chair or isolation tank. 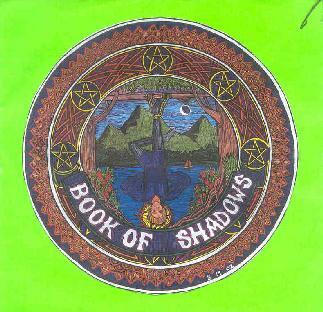 For more information you can email Book Of Shadows at: st37@ev1.net. Contact via snail mail c/o Carlton Crutcher; 1402 B Tall Shadows; Austin, TX 78617.